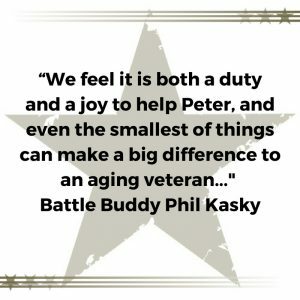 Phil and Mary Kasky, Battle Buddy volunteers. Phil Kasky, Captain, USN (Ret) and his wife, Mary, one day attended a December 2016 holiday event at Warrenton VFW, Post 9835. During this event, there was a presentation by two local residents, Molly Brooks RN-BC, CHPN, and David Benhoff, LtCol, USMC (ret). Phil and Mary, along with many other families and VFW members were at the VFW for this holiday gathering. Kasky shared what he heard at the beginning of the presentation: “In Molly’s opening remarks about our aging veterans Molly said, ‘They fought for you. Will you help us fight for them?’” Kasky noted the Hero’s Bridge co-founder provided an overview on why Hero’s Bridge was founded, and what they do. “They [Hero’s Bridge] sought to offer services to veterans needing some help, to perhaps assist with replacing lost military records and medals, maybe offering small construction services such as assisting with installation of wheelchair ramps to their homes. Sometimes Hero’s Bridge can help veterans in emergencies to help pay for a heating bill in the winter,” shared Kasky. Molly presented information on the Hero’s Bridge program Battle Buddies, which pairs aging veterans with younger counterparts who help assess the needs of the older person, assist with services such as transportation to appointments, arrange hospital visits, provide companionship, and who are available to the veteran during critical times. 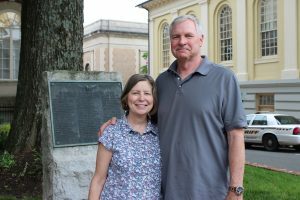 Armed with his knowledge and what he learned about Hero’s Bridge programs for senior veterans, Kasky and his wife began the journey of becoming a Battle Buddy. They were paired with a local Vietnam veteran, Peter, who is 87 years old and suffers from a multitude of maladies due to his exposure to Agent Orange, a chemical which causes major health problems to individuals who were exposed in the Southeast Asian environment. Kasky and his wife are honored to help their Buddy in this last “phase of his life.” Kasky also shared that “Hero’s Bridge needs volunteers to help in this mission.” Both he and Mary encourage others to participate in the Battle Buddy program because it is a fulfilling experience for all involved. For more information on volunteering for the Hero’s Bridge Battle Buddy or one of it’s other programs, please visit www.letsvolunteer.org for more information.